For other uses, see Umbra (disambiguation) and Penumbra (disambiguation). 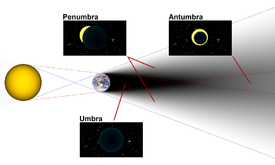 Umbra, penumbra and antumbra of Earth and images that could be seen at some points in these areas (note: the relative size and distance of the bodies shown are entirely fictitious). The umbra, penumbra and antumbra are three distinct parts of a shadow, created by any light source after impinging on an opaque object. Assuming no diffraction, for a point source only the umbra is cast. These names are most often used for the shadows cast by celestial bodies, though they are sometimes used to describe levels of darkness, such as in sunspots. The umbra (Latin for "shadow") is the innermost and darkest part of a shadow, where the light source is completely blocked by the occluding body. An observer in the umbra experiences a total eclipse. The umbra of a round body occluding a round light source forms a right circular cone; to a viewer at the cone's apex, the two bodies are equal in apparent size. The distance from the Moon to the apex of its umbra is roughly equal to that between the Moon and Earth (384,402 km (238,856 mi)). Since Earth's diameter is 3.70 times the Moon's, its umbra extends correspondingly farther: roughly 1,400,000 km (870,000 mi). "Penumbra" redirects here. For other uses, see Penumbra (disambiguation). The penumbra (from the Latin paene "almost, nearly") is the region in which only a portion of the light source is obscured by the occluding body. An observer in the penumbra experiences a partial eclipse. An alternative definition is that the penumbra is the region where some or all of the light source is obscured (i.e., the umbra is a subset of the penumbra). For example, NASA's Navigation and Ancillary Information Facility defines that a body in the umbra is also within the penumbra. Scale diagram of Earth's shadow, showing how the umbral cone extends beyond the orbit of the Moon (the Moon is indicated by the yellow dot). The antumbra (from Latin ante, "before") is the region from which the occluding body appears entirely within the disc of the light source. An observer in this region experiences an annular eclipse, in which a bright ring is visible around the eclipsing body. If the observer moves closer to the light source, the apparent size of the occluding body increases until it causes a full umbra. ^ Pogge, Richard. "Lecture 9: Eclipses of the Sun & Moon". Astronomy 161: An Introduction to Solar System Astronomy. Ohio State University. Retrieved July 16, 2015. ^ Event Finding Subsystem Preview Navigation and Ancillary Information Facility.